Gold Coast will be finals bound in 2015 if new coach Rodney Eade's claims Gary Ablett is ready to emulate NBA superstar Michael Jordan and inspire greatness at the Suns are anything to go by. 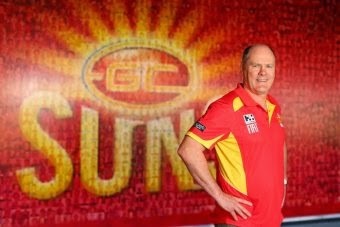 Eade, 56, may be the new Suns coach but he faced the same old problem when he was officially unveiled by the AFL club on Friday - ditching the Gold Coast's "one-man team" tag. However, Eade compared Suns captain Ablett to the Jordan of the late 1980s who dominated the NBA but only went on to win an astonishing six championship rings after instilling belief in his team-mates. "I liken him to Michael Jordan of the Chicago Bulls where he was the best player in the competition but they didn't win championships," he said. "It was his part as a leader that he was able to drag those players or educate those players to be able to believe in themselves and take it to the next level. "And I think Gary can do that." Eade said initial Suns player feedback convinced him they were finally ready to follow two-time Brownlow Medallist Ablett's stunning example. Foundation coach Guy McKenna was dumped on October 1 with a year left on his contract after Gold Coast lost six of their last seven games without an injured Ablett to miss out on an historic first finals series this year. "I have spoken to some of the players and they are ready to take the mantle, to take the pressure off Gary," Eade said.